When KiwiSaver was introduced to New Zealand in 2007, Tongan-born and raised Senituli Tu’aefe was quick to join. Although he made consistent contributions from the outset, he found it difficult to get information about his investment. So Senituli transferred his KiwiSaver to the award-winning high-performing Generate Fund with NZCU Employees. The greater ease of communication at NZCU makes him happier, enabling Senituli to focus on his No 1 dream – buying his first family home. Born and raised in Talafou, south of the capital Tongatapu, Senituli Tu’aefe came to New Zealand to make a life for himself. A steel worker for Fletcher’s Steel division, Senituli worked hard to make a life here, not just for himself, but his wife and two sons. 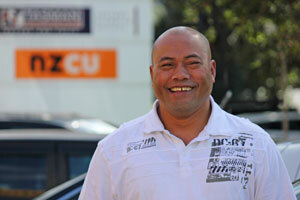 He joined NZCU Employees more than a decade and a half ago, a decision he has never regretted. While he began his KiwiSaver journey elsewhere, NZCU Employees became his primary banking provider. Therefore it only seemed right to him to transfer his KiwiSaver to the Generate Fund with NZCU Employees, too. “I wanted to move everything to NZCU, because I am happy here,” says Senituli. NZCU Employees staff member Ana Vaiangina recalls signing him up with login details so he can access his KiwiSaver online. “Even if he doesn’t check online, being with NZCU Employees is still easier for him, as there’s no language barrier when he calls in. Senituli agrees, saying it’s good to be able to understand what’s happening with his investments. Ana says he’s now in good hands, with a provider that will prove beneficial for him in the long run as its service-focused and has consistently been awarded Gold Ratings in 2016, 2017 and 2018 by SuperRatings. As the Investment Provider of the Year in 2015 and 2016 by the industry, Generate has a proven track record of quality investment. Having talked Senituli through the scheme and ensured he understands how he can maximise his benefits, Ana says providing he meets the conditions, it’s just a matter of working and saving before he can take advantage of the grants available to help him and his family become homeowners. “The main thing I want is a home for my family, as we’re renting still,” says Senituli. Generate Investment Management Limited is the issuer of the Generate KiwiSaver Scheme.